Youngstown State University guard Cameron Morse (24) drives past a defender on his way to the hoop. With the Youngstown State University men’s basketball team (11-20, 5-13 Horizon League) losing its final regular season game to Cleveland State University (9-21, 5-13 HL) 69-55, those two will play again. YSU finished the season as the eighth seed in the Horizon League and CSU ended the year as the ninth seed. That means they will play each other to start the tournament. They split the season series with each team winning on its home floor. Slocum said that this is a game that the basketball team is looking forward to. In both games against CSU, YSU shot better both times but turnovers were the biggest issue. YSU had 15 turnovers in its home win and 17 turnovers in its road loss. Slocum said that knowing that at this level whoever wins the tournament will go to the NCAA tournament and that’s it is a lot of motivation. On CSU’s side, guard Rob Edwards leads the Vikings at 16 points per game while shooting on 41 percent shooting. 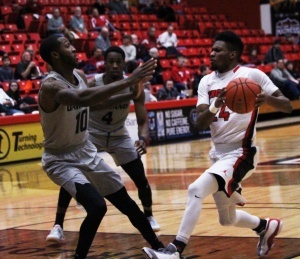 For YSU, guard Cameron Morse has been its rock averaging 22.8 points per game on 42 percent shooting. In his last four games, Kaufman is averaging 13.3 points per game with almost eight rebounds per game. He also shot 71 percent in that span. CSU has lost five out of its last seven games including its win against YSU while YSU has lost seven out of its last eight games. YSU comes into this game having lost some very close games and Slocum said that they will use games like that to help them in this one. To go along with Morse, point guard Francisco Santiago is tied for the league lead in assists at 4.6 per game. He also boasts the second-best assist-to-turnover ratio at 2.10. Slocum also said that you have to be opportunistic about playing a team like CSU and in this tournament as a whole. YSU will have to fend off the best turnover team in the league in CSU to advance to the second round. If YSU wins, it will face Oakland University (24-7, 14-4 HL) who is the No. 1 seed. Oakland defeated YSU twice in commanding fashion and would be a tough test for the Penguins to overcome. 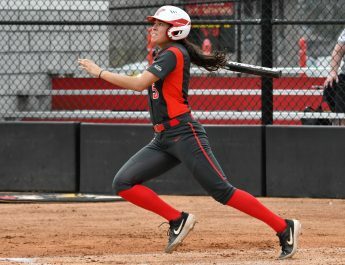 YSU plays CSU on March 3 at 2:30 p.m. If YSU defeats CSU, it will play March 4 at 5:30 p.m.